Over the past few decades the way that people receive information has drastically changed. 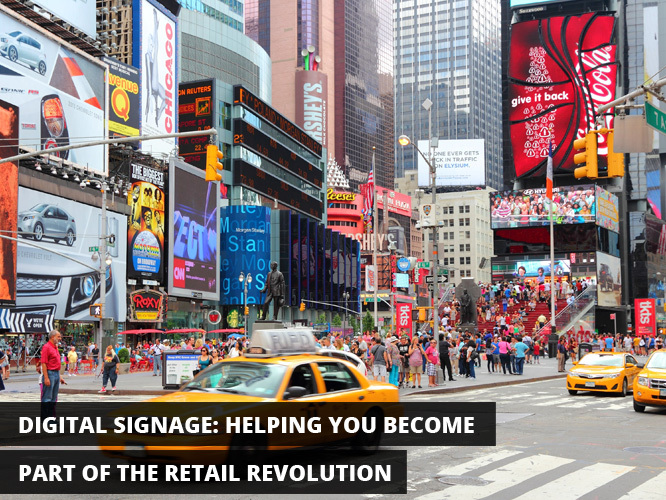 While static images on billboards and in windows used to dominate the advertising scene, the advent of digital signage (https://signworld.org/the-digital-signage-revoloution/) has created endless possibilities to engage potential customers in a whole new way. Your retail business stands to benefit from these changes with the use of digital signage. It is undoubtedly important to have signs outside of your business; the very presence of a sign can drastically increase the amount of traffic in your store (https://signworld.org/category/blog/page/2/). But with digital signage in front of your store, all of the opportunities available through window signage (https://signworld.org/how-to-attract-customers-to-your-retail-store-using-window-graphics/ and https://signworld.org/retail-window-signage-design-ideas/) can be multiplied. Before customers even enter your store you can show them your hottest items in store and any special deals or sales that you might have on. Catch the eye of people who happen to pass by your store. Draw them in with dynamic signage; motion draws the eye, so use it to your advantage. Use video or slide shows to capture your audience before they even enter your store. With so many options for the modern consumer, you need to make sure that your store stands out and attracts customers. With the potential to display products and specials to passersby, you can ensure that the customer chooses you. Not everyone is going to have a chance to look at your catalogue or, for example, if you are a clothing store, see your designs on the runway. You can use digital signage to show your catalogue items and even video footage of models sporting your garments for the latest seasons. While manikins and displays are useful for helping your customers visualize what your product might look like in use, digital signage provides a space-saving way to show as many set-ups of your product as you want. Digital signage will also allow you to update your signage on a day to day basis based on sales and specials. Let your customers know when you get new stock of an exciting item, or when something is at a reduced price. Do you have a big promotion coming up? Simultaneously update all of your signs in store and elsewhere with the new information. This also means that if you have a short-term promotion you will not have to spend a ton of money on signage that will have limited use. Another thing to consider is the possibility for interaction with your potential customers. You can use digital signage to increase customer interaction (link to article I wrote about digital signage and interaction) with your products by placing digital signs that have a touch screen feature. Use the touch screen capabilities of digital signage to allow customers to browse your selection. Having the chance to see what you offer before the customer arrives in the store can help them to build a relationship with the product before they have even seen it first hand. Think of this strategy as a middle-ground between in store and online shopping. You can also use the touch screen feature to help customers find your nearest location. The addition of a map to your store will make it that much easier for customers to come to you. Customers make 60% of buying decisions in store. If you can prime customers before they even arrive at your store with information about your product, you can further revolutionize modern retail. You can use this handy guide (https://signworld.org/retail-signage-tips/) to determine how to place your digital signs to increase their impact, and your profit.